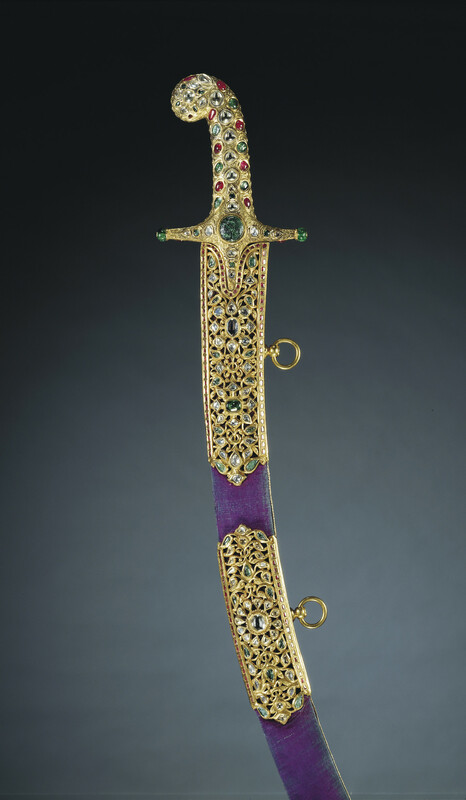 The hilt of this sword is made of solid gold encrusted with diamonds, rubies and emeralds, with a large circular engraved emerald at the centre. At the top or forte of the wavy-edged blade is an ornamental etched panel and an inscription on the other side records the date according to the Hindu calendar 'Samvat 1921' (i.e. 1864 AD) and the Maharaja's name. The impressive gemstones and exceptionally fine watered crucible steel blade suggests that this may have been the personal sword of the Maharaja of Kashmir.